When Cobra takes over a city, it has to be won back block by block, house by house, room by room! 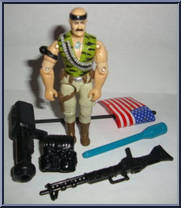 BARRICADE, G. I. Joe's urban assault specialist, has nerves of steel and trip-hammer reflexes necessar. . .
BIG BEAR grew up in a place where the conditions are cold, wet, and nasty-every day! He can be meaner than a Siberian wolf with its leg caught in a steel trap and wilder than an [sic] Murmansk fur mer. . .
From his grim castle in the Scottish highlands, DESTRO builds and peddles his instruments of destruction! Destro and COBRA COMMANDER despise each other, but maintain an alliance of convenience. Althou. . . 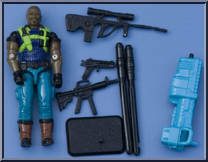 It takes a special type of old Army sergeant to be the "top-kick" or "first-shirt" of an elite unit like the G. I. Joe team, and DUKE fits the bill. He's got to be the main discipl. . .
EELS are proficient with sophisticated electronic detection gear, the latest in plastic explosives and state-of-the-art, closed circuit self-contained breathing systems. All of this, along with their . 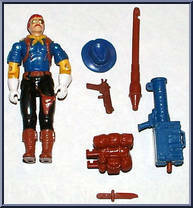 . .
FIREFLY has been blowing things up for Cobra since COBRA COMMANDER first donned his hood and opened up for business. 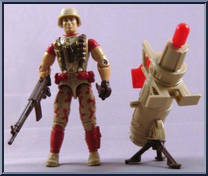 Since that time, Cobra has expanded to include entire battalions of bomb-planters, . . .
FLAK-VIPERS have a passive, infrared targeting and sighting system built into their helmets. This allows them to fire extremely accurate Tail-Biter missiles at G. I. Joe aircraft with absolute impunit. . . 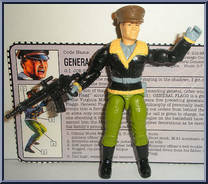 He's the son of the original G. I. Joe Commanding General (after whom the U.S.S. Flagg aircraft carrier was named). GENERAL FLAGG is a graduate of the Virginia Military Institute, as were five precedi. . . When the going gets rough, that's when the Marine Corps gets sent in. The same is true for G. I. Joe. When his buddies have their backs against the wall, that's when GUNG-HO moves in to do some heavy . . . 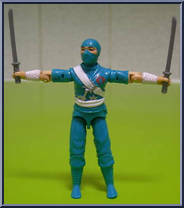 Recruited from the highest ranks of Cobra's Viper Corps, the COBRA NINJA VIPERS are the elite representation of Cobra's new elevated level of ruthlessness. Only the most sinister and cunning Cobras ar. . .
What can you say about a guy who totes a 134 pound machine gun as his personal weapon and who can whip up a mean crawdad stew? Not much. You just stay out of his field of fire, and ask for seconds. RO. . .
WET-SUIT has been characterized as being "175 pounds of mean on the hoof" and is definitely not known for his social graces. He is not the type who goes over very well at the Chaplain Assist. . . The original G. I. Joe helicopter pilot, WILD BILL is also an expert tracker and can function on the ground as well as any expert infantry scout. He adapts the hunting skills he learned as a boy whene. . .